I had a wonderful trip up to teach at the Dayton Guild. It was my second time there. I really enjoyed myself although it was a long day. I've spent a lot of time uploading patterns to the Spring issue. Is should go live early next week. We just need to put the finishing touches on it. My students let me have an easy week. I only got two to review! I made good use of the time. I feel like I have been chained to my computer. I figure it takes about 3 hours per pattern and article. That doesn't include the time spent on emailing designers and yarn companies. Another self-serving tip... I actually thought ahead to the Summer issue. 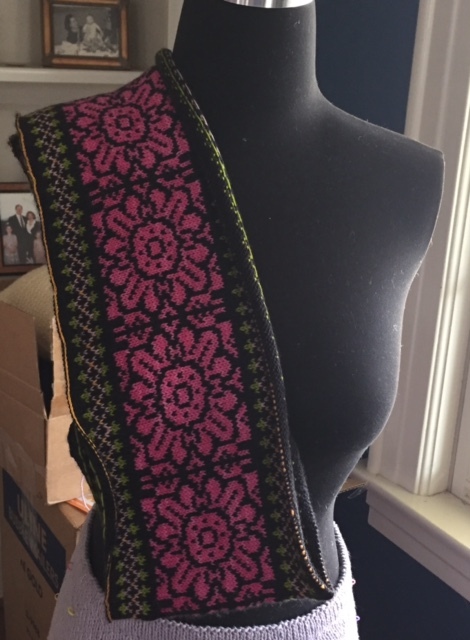 I'm doing a skirt, top down, and I wanted to do the waist band so I can try it on. I might actually keep this one. When you do the waistband of a skirt you have to make it elastic enough so that you can put it on. 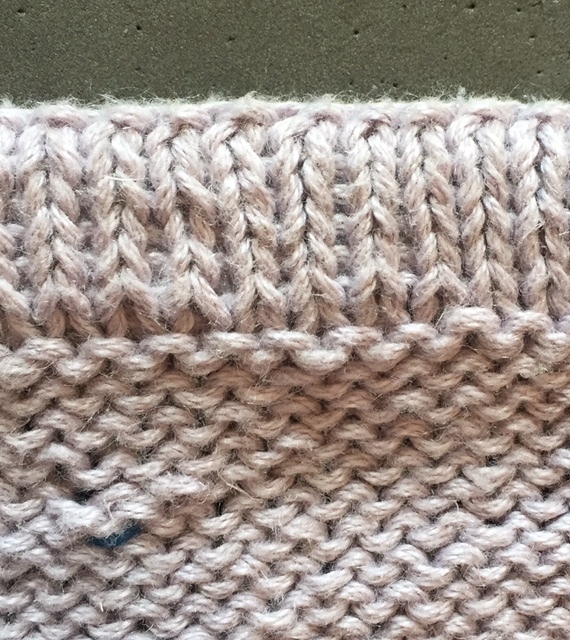 There is no way you could just cast on (or bind off) for the waist band. I learned this the hard way the first time I did a skirt without an opening. I generally knit skirts from the bottom up and just graft the live stitches during the finishing process. 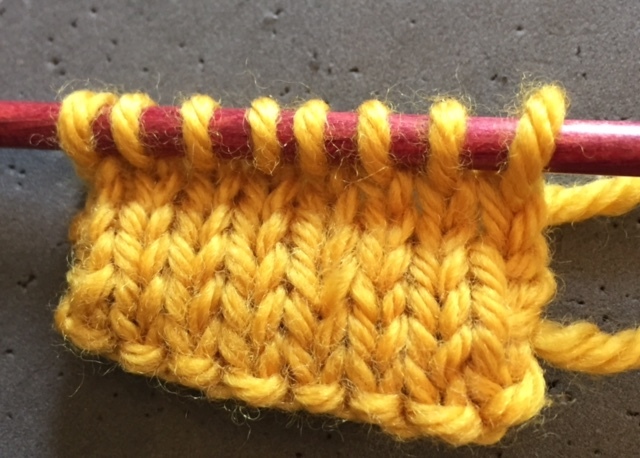 This time I used a provisional cast on and when the waistband was done I put the stitches on a needle and did a three needle bind off without the bind off. This is very elastic. As I knit the front to the back I inserted the elastic. That is another thing I learned the hard way. It is a miserable experience if you try and insert the elastic when the waistband is almost done. 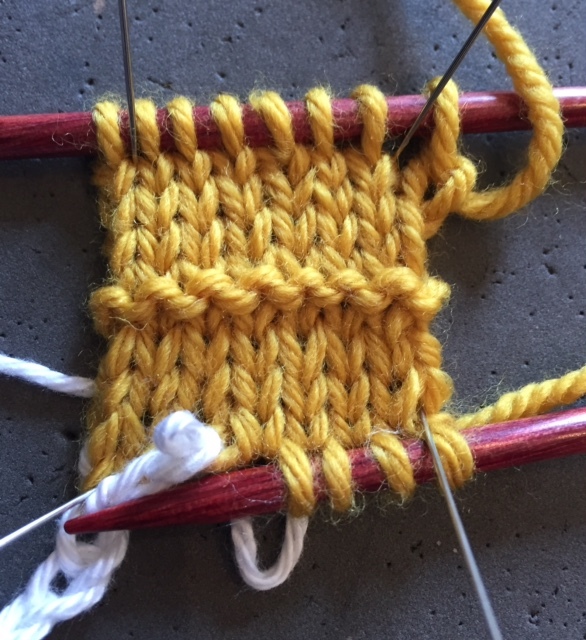 Next you fold it over and knit together the stitches from the front side to the back side. For my own projects I almost ALWAYS use my super pointy Chiao Goo needles but I tend to use wood needles to do this. Using three needles is a big pain especially when the stitches slide off. Here is photograph of the final product. The photograph after that is inside of the skirt that I am working on. If you look close you can see the row marker I put in the skirt to mark an increase. Salon will be early on Sunday...11:30 am to 1:30 pm. I'm going to the MET simulcast of Idomeneo on Saturday. It is a treat after all my hard work this past week. Before I got the yarn from Classic Elite for the design, I started on the scarf project with the Baah yarn. I decided to do a provisional cast on and then leave the top stitches live. I'm going to knit a second one to match with the colors for the flowers reversed. 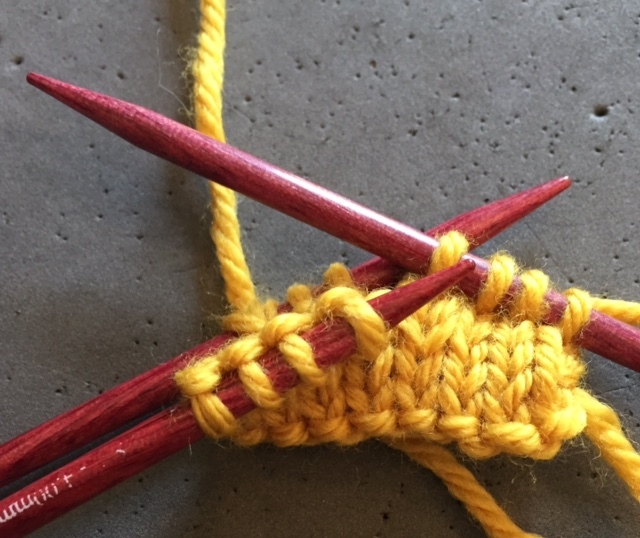 I will close both ends with a three needle bind off. I want matching edges. The inside piece will have to wait until I finish the stuff for cast on. 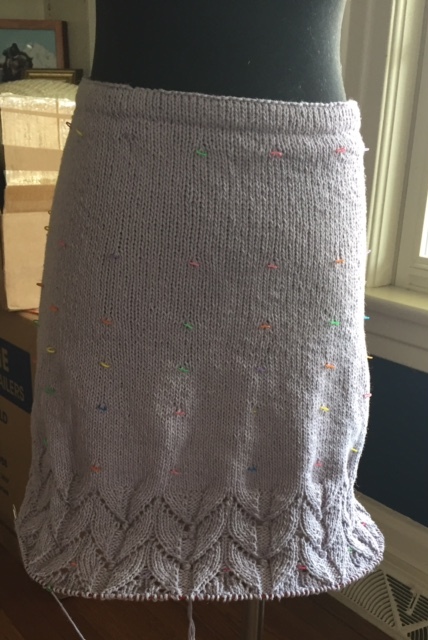 Here's the skirt. It will be mid-calf length. Blocking is very necessary! It is MUCH fuller than it looks in the photo.